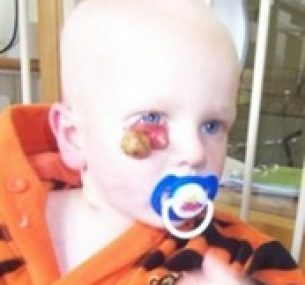 In early June 2009, we had noticed that Ross, our 18 month old son, had a puffy area on his lower right eye. We took him to our GP who said it was probably a blocked duct and would refer Ross to the eye pavilion for clarification. Five weeks later, Ross’s eye started to get bigger. I called our GP surgery to confirm that Ross had been referred to the eye pavilion but the waiting list was 18 weeks. I decided to use my private medical insurance. The doctor referred us to the private hospital and I called to make an appointment. When I phoned, I was told that there was only one eye specialist that would see children and he was on holiday. The first available appointment would be 12 August. The following week Ross’s eye grew rapidly, so I took him back to the same GP I’d seen the week before – we got an emergency appointment that afternoon at the eye pavilion. Once the eye specialist looked at Ross, I started to feel really worried. He consulted with the senior doctor who sent us straight away for an ultrasound scan. They booked us in for a biopsy on the Monday (this was a Friday). Once the biopsy was performed, we were told that Ross had cancer – that is one of the worst moments of our life. He was diagnosed with orbital rhabdomyosarcoma, a type of soft tissue sarcoma. We had no idea what this was or what we were going to have to deal with. Ward 2 staff were fantastic in taking the time to explain and help us understand things. Ross started the European rhabdomyosarcoma protocol – the current European-wide agreed guidelines for the treatment of rhabdomyosarcoma in children. After the first cycle of chemotherapy when Ross was neutropenic (he had a low white blood cell count), he contracted Staph Aureus Septicemia, a nasty blood infection. This was the big low point for us as we did not know if he was going to pull through this. Thankfully, with the help of specialists and the right combination of meds, he started to respond. The cancer did not respond as well as expected after the three cycles of chemotherapy so a course of radiotherapy was on the cards. This didn’t sound too bad to us and the ward staff did not make a big deal out of it. Then, we met with the radiotherapy oncologist and learned of the side effects from traditional radiotherapy. This included increasing the chance of developing a second cancer throughout his life. As any radiation would be targeted under the eye, it is close to the pituitary gland (responsible for his growth) and the front of his brain (where his learning and development could be affected). There was also the likelihood that he would need cranio-facial surgery, as his facial bones and their growth would be affected by the radiation. As Ross was only one year old, the more severe the side effects would be for him. We went home and I researched and hunted the internet and came up with proton beam therapy. The downside – this was not available in the UK. I then started to contact the leading NHS specialists and approached our radiation doctor. She was happy to submit Ross for approval. After four weeks, Ross had NHS funding and approval (the first patient in Scotland) to travel to Jacksonville USA for five weeks of proton treatment. We left the UK on 18 December 2009. We had to organise everything ourselves so, as well as looking after a very sick child, we had travel arrangements, insurance etc to sort out. First thing when we arrived in US was that Ross had to get titanium screws fitted into his skull to ensure the utmost accuracy during the treatment. Proton is accurate to 2mm as opposed to over 1cm with traditional radiation – a huge difference in a one-year-old child. It also does not have an exit point which meant no radiation to his brain. Our time in the US was long but it was enlightening and interesting and of course plenty of great shopping! The positive outcome of our journey is that other families have been able to follow us over to US for treatment. 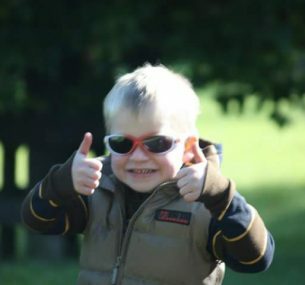 We had a scan in March 2010 which was inconclusive but after a further scan in June 2010, we heard the fantastic word REMISSION!! Ross will have lifelong eye issues and will probably have some growth issues but hopefully nothing requiring surgery. There’s also the possibility of side effects related to the chemotherapy. But he’s still here, he survived and everyday I am so, so thankful for that and also everyday I pray that it doesn’t come back! Ross has a big sister Katie who is four, Dad – Andy and Mum (me) Lesley. He also has a webpage that was created by a neighbour that also has more pictures and information on proton. Ross enjoys his football and swimming. He currently swims with Tranent ASC and has been offered a place in the East Lothian development swimming team squad from August 2017. He embraces life and works hard at everything he does. He has long-term side effects, right eye damage and cognitive issue, so many things he does he has to work twice as hard to do things, but his determination and love of life always shines through. 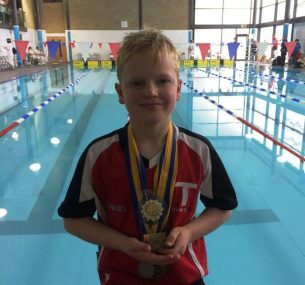 He has worked exceptionally hard at his swimming and has been very successful in his age group over the last three months.